By Kaiu Shirai and Posuka Demizu. Released in Japan as “Yakusoku no Neverland” by Shueisha, serialization ongoing in the magazine Weekly Shonen Jump. Released in North America by Viz Media. Translated by Satsuki Yamashita. At long last, we get to meet the famous William Minerva… or at least his echo. I liked the self-awareness that both Emma and Lucas had when they got to the elevator and went “…really? An elevator to freedom/ Is it THIS easy?” No, of course it isn’t that easy. In fact, it turns out that William Minerva may no longer be with us, though that doesn’t stop him from leaving a recording that helps our heroes to buckle down and not give up. It also reveals that this WAS meant to be a safe harbor, and it’s the demons who corrupted Goldy Pond and turned it into a hunting ground. 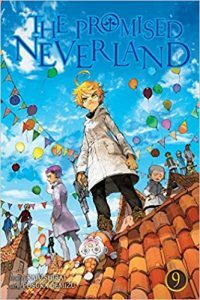 There’s lots of odd otherworldly touches in the early part of this book, like the literal pond of gold whose water doesn’t get you wet, that reminds the reader that The Promised Neverland is as much science fiction as it is horror or mystery. Meanwhile, I’ve been saying ever since he was removed ffrom the plot that Norman would prove to not be dead, and that is the case. That said, the chapter featuring him is one big “what the hell?” after another, and is meant to plant seeds, especially given that one of the kids in Emma’s group at Goldy Pond (who seems to have a learning disability) keeps repeating Norman’s number. How long has it been since the start of the series? Norman’s in much the same place he was at the first volume – solving tests, amazing folks with his intelligence, and trying to escape even though it’s even more impossible than it was at Grace Field. What’s more, the guy who’s his minder is the same guy who betrayed “William Minerva”. And, lest you forget that Promised Neverland is also a horror title, there’s that two-page spread of the room of experimental humans Norman walks past. In just one chapter you get about thirty things to think about. Back at Goldy Pond, the next hunt has been scheduled early because the demons want to eat Emma SO BADLY. Fortunately, our heroes are prepared for it, and so we get a few chapters of the kids showing they’ve been holding back and taking out the mook demons. This includes one who leers at the reader and says “How Cute”, which makes me wonder if this homage to Kaguya-sama was in the original Japanese or if this is just a Viz invention. There’s lots of scenes of the kids seemingly cornered only to win out in the end, which I will happily read over and over again, and not every battle runs along the same lines, which is important in a long-running shonen title like this. That said, I doubt this series will be going to 90+ volumes like One Piece. But it is going to double digits, as the cliffhanger shows Emma confronting the strongest and cleverest of the hunting demons. I hope I don’t need to repeat myself: Promised Neverland is consistently excellent, and I like how it’s really showing off that just because it left Grace Field (the cliffhanger to the first anime season) does not mean it’s all over. Essential.